Nightingale is a completely free, open source audio player and web browser based on the Songbird media player source code. 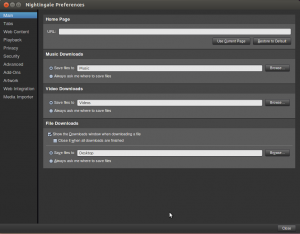 As such, Nightingale's engine is based on the Mozilla XULRunner with libraries such as the GStreamer media framework and libtag providing media tagging and playback support, amongst others. Since official support for Linux was dropped by Songbird in April, 2010, Linux-using members of the Songbird community diverged and created the project. 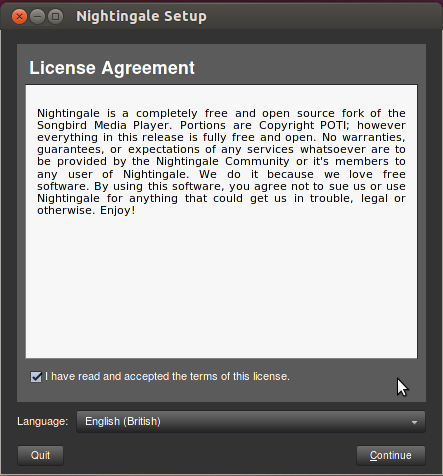 Contrary to Songbird, which is primarily licensed under the GPLv2 but includes artwork that is not freely distributable, Nightingale is entirely free software, licensed under the GPLv2, with portions under the MPL and BSD licenses. Multi-platform compatibility with Windows XP, Vista, 7 and Mac OS X v10.5 (x86, x86-64). 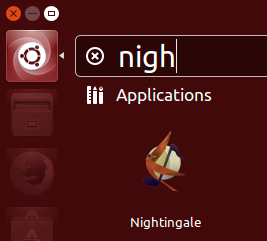 Users can add features and change functionality in Nightingale by installing extensions. Extensions are similar to the Extensions for the Firefox browser and can be easily ported. Community coded extensions are available on The Nightingale Addons Page. Skins are referred to as "feathers" in Nightingale, and give users and artists the ability to change the look of Nightingale via an extension which generates a default skin. Using CSS (and optionally XUL), and an image manipulation program such as Photoshop or GIMP, users are then able to make Nightingale look however they want.